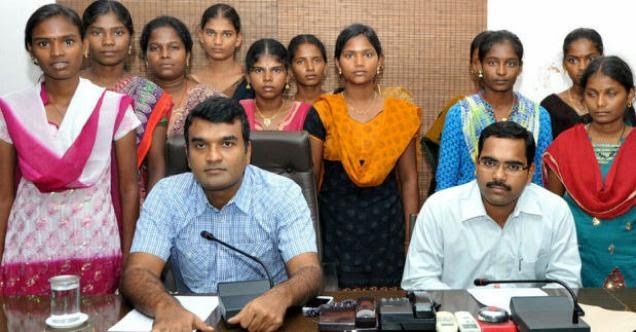 Perambalur district Collector Darez Ahamed (left) and subcollector P. Madhusudhan Reddy with a group of schoolgirls who were saved from child marriages and who cleared the plus two examinations in Perambalur. The Plus Two results, which were published, have opened a new chapter in the life of 17 girls, who were rescued from child marriages by the officials in the recent past. These girls, following persuasion from the district authorities, overcame the trauma soon and continued their studies, and have come out successful in the Plus Two examinations. Thanks to the initiative of District Collector Darez Ahamed, 302 child marriages were prevented by the revenue and social welfare officials at the 11th hour in the last three years across the district. A majority of them were schoolchildren in the 13-17 age group. The Collector made arrangements to provide counselling to girls and parents, who underwent severe pain and strain in the initial stages, through the district child protection unit and the Education Department. They were assured all help for the continuation of their studies. These persuasion tactics paid results with the girls agreeing to continue their studies, much to the satisfaction of the authorities. All the 17 girls, who continued Plus Two after their aborted child marriage, have come out successful, much to the delight of their parents and the district authorities. Some of them have secured high marks and the topper among them secured 1,010 marks. A beaming Mr. Ahamed felicitated all the 17 girls at a brief function held at the Collectorate building in Perambalur. He took advantage of the opportunity to interact with them and their parents about their future plans. He said they would be provided free education along with other needed help if they preferred to pursue courses offered by the two government arts colleges functioning in the district. Mr. Ahamed directed the education officials to provide suggestion to the students who preferred to attend counselling for professional courses. He advised them to prepare for competitive examinations. Who came to Modi's swearing in ceremony? Lok Sabha OK for NaMo. How about Rajya Sabha? Somewhere in "Detroit of India"
Congress NOT to back III Front. Disclaimer: Most of the information has been obtained by reading various newspapers / magazines, watching television and browsing through various websites. Pictures and Articles used are for informative and illustrative purposes only and their copyright belongs to their respective owners. Some of the popular sources of information are: The Hindu, Indian Express, India Today, Dinamani, Dinamalar, Puthiyathalamurai, NDTV, CNN IBN,…. These are my home's Kolam (Rangoli) for Pongal festival, done by my mummy and my sister. @ Senthil Kumar.. Simple theme. Theme images by ULTRA_GENERIC. Powered by Blogger.